For whatever reason it did not gain much coverage in the UK nationals, nor trade papers, but AERBT would like to brief readers on a serious cruising incident from which one operator emerged with much credit, whilst with the other we will leave readers to make up their own minds. With the 2011 hurricane season reaching its vicious peak towards the end of August two ships were caught in the Puerto Rico port of San Juan, Carnival Victory and Royal Caribbean Serenade of the Seas. For the vessels own safety the authorities ordered them both to sea three hours before the advertised departure time leaving a total of 450 passengers on land, many without passports, money, and only the clothes they stood up in. It could happen to you. Carnival and their agents appreciated the problem and to their credit organised accommodation and flights, the passengers catching up with the ship in Barbados. Legally they did not have a responsibility, the situation being 'force majeure' and covered under various Conventions and liabilities. Sadly not so Royal Caribbean who were within their rights to abandon the once happy passengers. “As a gesture of goodwill, and in recognition of the time they missed on board Serenade of the Seas, Royal Caribbean provided each guest who was not able to arrive to the ship before it departed San Juan but met the ship later, with a future cruise certificate for 30% of the cruise fare paid for their sailing. “We are in the process of contacting those guests who were not able to sail with us at all to inform them of their compensation, and would prefer that the impacted guests learn of the amount directly from the line before it is disclosed publicly. Compare this with Viking who had trouble kicking off the St Petersburg to Moscow riverboat season a couple of years back. 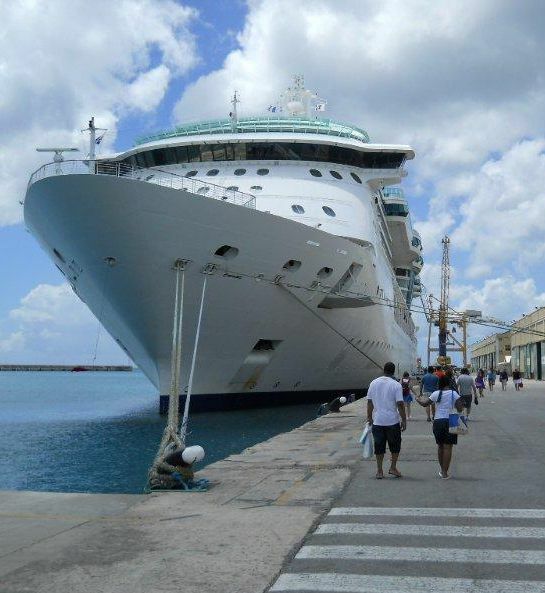 The ship was not ready and clients had to be accommodated in a local hotel for two nights. Faces lit up when arriving home after what turned out to be a fine trip. A substantial compensation cheque was on the doormat. Guests are rebooking. Having survived an office move, and domestic one too, plus the 21st century technological consequences, your Editor felt that a short ex-UK cruise might fit the bill for a break. He would be joining experienced cruisers plus nearly 50% of passengers who had never been to sea before. It would also be a first time with Fred Olsen the world’s second oldest shipping company, after P&O. Established in 1848 Fred Olsen is a large Norwegian shipping company headed by the fifth generation of the family with its cruise operation very British and based in the UK. The company offers four ships, all of previous ownership but maintained to the highest standards. Ours was Balmoral, 43,000 tons and 1,350 passengers. She is big enough to incorporate just about everything much larger ships include, two heated outdoor swimming pools for instance, but the reduced numbers on board means that getting on and off at ports is easy (or joining the ship – often a source of aggravation), and there is more than enough deck space for everyone to sit out. Somehow Olsen’s manage to include just about everything one would get on a longer voyage including a nicely presented formal night when the Captain welcomes the guests. It is also the leaving party! Our mini-cruise was typical, leaving Southampton mid-afternoon for a leisurely meander down the English Channel to Ijmuiden, the direct port for Amsterdam. With a lunchtime arrival it was possible for a quick visit by road or canal to Holland’s largest city. Overnight on to Antwerp (Belgium), and a mooring right in the middle of the city. The local open-top bus did splendid business on a glorious autumn day, a one hour trip long enough to gain a very favourable impression of the world centre of the diamond trade. 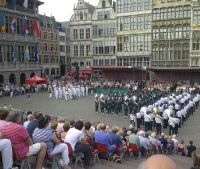 Our visit coincided with ceremonies commemorating the relief of Antwerp in 1945 by the Canadian Army, commanded by a Czech. Next stop Dunkirk and a visit to the beaches of 1940, these days just miles of sand dunes and not a hint of the terrible carnage suffered by the British and French Divisions during those few June days. Churchill, then the new Prime Minister, turned what was utter defeat into a propaganda victory. Well worthwhile visiting is the Operation Dynamo (Dunkirk) Museum, housed in a bastion built to defend France in 1874 following the Franco-Prussian war. A film using dramatic period footage, with a duration of approximately 15 minutes, gives an excellent overall view of the events of May-June 1940. Balmoral has nine decks and a crew of 510. She was extensively refitted in 2008. Named after the Scottish home of the Royal Family, the ship offers 710 cabins and suites. All Balmoral’s public rooms have a Scottish theme, its principal restaurant, Ballindalloch, named after the Speyside village and castle; while the ship's other two formal eateries, Avon and Spey are titled in honour of two of Scotland's loveliest salmon rivers. These two restaurants are amongst the nicest afloat each overlooking the sea with the galley and buffet area in-between, open for breakfast and lunch, but very much hidden away for dinner. 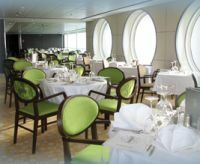 Unlike the rest of the ship, which is very much art-deco, these dining places are modern in design, quiet and reserved. The food is good also, the same menu as the Ballindalloch, best described as British with a continental flavour. And some eastern dishes too. You can eat informally in Palms Cafe, with a different menu. Unlike some other cruise lines there is no alternative dining at a premium, the variety more than enough. Nor 24 hours public area eating, but there is a more than adequate cabin menu outside the normal extensive dining hours. No charge of course. For the young at heart there is a midnight buffet (which starts at 23.30). Balmoral also benefits from an on-board pub, which has been recently refitted and offers evening entertainment as an alternative to the main cabarets and dancing in the Neptune or Lido Lounges. Or you could just relax with a drink in the Observatory Lounge, with its spectacular views out to sea and later in the evening dance the night away there on its popular disco-dance floor. Bar charges are very reasonable. There was no time to practice our golf swing in the nets, but one visit only to the well provided gym, and just four laps of the promenade deck for a walk, which equalled one mile. Madam inspected the beauty salon and spa and said it met her approval. If you want to try on a taster cruise book ahead. There is a fine library, internet room (which worked very well), gaming facility and a selection of slot machines. On this short trip the excursions manager provided a 45-minute talk on the destinations which also went out on the ship’s TV circuit. If you want to keep in touch with what is happening in the world a free shipboard version of the Daily Mail is provided and there is of course BBC TV, Sky and Bloomberg for the share watchers. Limited facilities for children are provided and during the school holidays carers too. Balmoral seems to cater for all age groups and the few youngsters on board during the mini-cruise seemed very happy. Three- and four-berth cabins are available. Smoking is permitted on specially designated outside areas only. Accommodation is mainly of 165sq ft cabins, with or without a balcony, and a decent size shower room. Cabins are very well thought out with enough hanging space for long cruises. All have interactive TV and some are equipped for disabled passengers (who will have no trouble with the ship). The beds can be single or double but if you want a double duvet, forget it. It’s a single or nothing! Our cabin had a large window and being on deck six made both the Ballindalloch restaurant and main reception/central atrium very accessible. A unique feature of the ship, on this deck, was a long central lobby with a fine selection of prints from the Ballindalloch estate, and some original paintings. And just a step from the cabin. If a suite is what you want these cover two decks at the top of the ship, and of various sizes. There are separate sleeping and dining areas, a bath (rather than a shower) and large balconies. A welcome bottle of wine is provided, fresh fruit, flowers and an afternoon canapé offering. A complimentary pressing service is provided for formal nights. Binoculars too, and an umbrella, if needed, for when on shore. These book very quickly. Fred Olsen surprised us with a thoroughly well thought out good value package. The pre-cruise paperwork was outstanding, typically being luggage stickers with one's name and cabin number already provided. PROGRAMME: There are 11 three and four night mini-cruises planned for next year plus an ex-Southampton Titanic centenary voyage which is of five days duration. Prices range from £339 to which you can add £4 per night tips. Terrific value. The service on board is excellent. Fred Olsen mainly cruises out of Dover, Portsmouth and Southampton with a limited programme from Greenock, Newcastle and Rosyth. AmaWaterways has launched its second new vessel on the Mekong River, the 124-passenger MS AmaLotus. The 7-night maiden voyage set sail last week after a traditional Vietnamese praying ceremony at the shipyard. The MS AmaLotus joins the MS La Marguerite (2009) in providing distinctive river cruises from Siem Reap, Cambodia to Ho Chi Minh City, Vietnam as part of the highly-popular 'Vietnam, Cambodia and the Riches of the Mekong' programne. 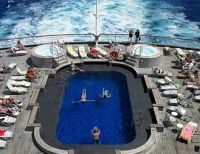 She features some large suites, the biggest at 624sq ft, 10 juniors at 290sq ft and standard staterooms at 226sq ft.
Azamara Club Cruises has published its 2012 Destination Guide. It is unique in that the photographs within the 144-page glossy production features lifestyle images by two student photographers who captured the cruise line’s exciting destinations and the service delivered by the staff and crew. The brochure highlights the cruise line’s two ships, Azamara Journey and Azamara Quest, their worldwide itineraries carrying guests to ports throughout the Mediterranean Sea, Northern and Western Europe, South America, Asia, India and the West Indies, and a variety of culturally-immersive Land Discoveries (shore excursions) and cruise tours. Your local travel agent should have the quality production, or contact Azamara direct. Cruise & Maritime Voyages is not one of the best known of British cruise operators but over the last three years has built up a reputation for offering value with two 'mature' ships Marco Polo and Ocean Countess. Both are child-free ship and offer British-style cruise with a highly rated entertainment, food and service on board. Whilst Marco Polo is essentially based at Tilbury’s London Cruise Terminal, Ocean Princess cruises from Dublin, Falmouth and Liverpool and offers this autumn/winter a whole variety of short trips with one just an overnight (Dublin to Falmouth and the Eden Project). Crystal Cruises have come up with a real occasion. Shipboard accommodation on Crystal Symphony and overnights in Rio de Janeiro during the Carnival celebrations. From grandstand seating and front-row box seats to luxury VIP sky box suites with gourmet goodies, guests have a choice of several fully escorted, reserved seating programmes at the Sambadrome. There’s even an option to participate firsthand – marching in the parade, dressed in costume and performing with one of the samba schools. Symphony’s Miami to Rio and Rio to Buenos Aires voyages on 6 and 20 February respectively end or begin on the parade’s two best nights, Sunday and Monday, when 30,000 glamorously-costumed members of the top samba schools thrill crowds with singing, dancing, drumming and colourful floats. Disney Cruise Lines Fantasy, the company’s fourth ship and the second of its two newest and larger vessels will call Port Canaveral home when the ship arrives next year. She is currently under construction at the Meyer Werft shipyard in Papenburg, Germany. While Fantasy will be similar to Dream, Disney says the two ships won’t be exactly the same. Disney’s first two ships, Magic and Wonder, are also similar, but not identical. Fantasy will include a night time entertainment area for adults called Europa, which Disney says will take inspiration from European travel. 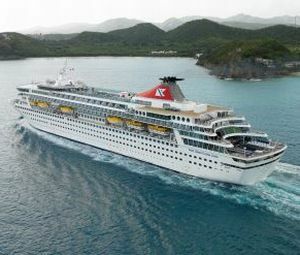 Fantasy will sail seven-night eastern and western Caribbean cruises from Port Canaveral with its maiden voyage scheduled for 31 March 2012. Orion Expedition Cruises will next April sail Orion II on an eight-night Japanese Culinary Adventure voyage to explore the wonders of Japanese cuisine – a must-do voyage for anyone interested in the rituals, history and philosophy of Japanese culinary art. This should be a remarkable journey of discovery using Japanese cuisine as a window into the culture, art and rituals of this ancient society. Orion II guests will have the opportunity to discover Japan and its ancient culture through the amazing diversity of Japanese food. At each port of call there is the opportunity to discover a different Japanese dish, learn its history and visit local markets to shop for ingredients. Orion II is a luxury ship accommodating 100 passengers in 50 cabins. P&O Cruises has confirmed several special guest entertainers for three highlight cruises this winter. Legendary pop group, The Searchers; Drifters lead singer, Ray Lewis, with his act Still Drifting, and the ultimate Abba tribute band, Voulez Vous, will entertain passengers on board Oceana in November and December. Quite rightly described by P&O as a family friendly ship Oceana will cruise year round from the UK for the first time this winter, visiting destinations with warm weather and winter sunshine, including the Canary Islands, Egypt and Greece. Travellers looking to explore the Western Mediterranean on their own next spring can do so with special single cabin fares on Ventura, a 14-night Western Mediterranean ex-Southampton cruise 1-15 April visiting Vigo, Lisbon, Rome (from Civitavecchia), Florence/Pisa (from Livorno), Monte Carlo, Barcelona and Cadiz. Passengers can also take advantage of free cruise connections from all over the UK. Paul Gauguin Cruises, who claim to be the longest continually sailing luxury cruise ship in the South Pacific, is to remodel its namesake ship, m/s Paul Gauguin, during an 11-night dry dock in Brisbane next January. The US$7m million renovation will include extensive enhancements to both interior and exterior of the ship. The Paul Gauguin is a custom built 20,000 full featured ship accommodating just 332 passengers with mainly 6/7 night cruises in and around Tahiti. Seabourn has announced details of its 116-day World Cruise in 2013 before even the 2012 one takes place (which leaves Ft Lauderdale 5 January – both with the new Seabourn Quest). Seabourn Quest’s 2013 World Cruise will call at 51 ports in 27 countries on six continents, featuring a combination of visits to world famous destinations and hidden gems, as well as overnight stays in some of the world’s greatest cities. It will visit an array of exotic destinations in the South Pacific, Australia, Indonesia and Southeast Asia, India, Arabia and the Mediterranean. Rates for the full cruise begin at £31,520 per person, based on double occupancy. SeaDream Yacht Club’s 112-guest SeaDream I will give its passengers the opportunity to see the 70th Grand Prix of Monaco 2012. If you have never been it is an unbelievable experience. Forget the motor racing and just watch the people and their waterborne palaces. And you will be joining them. Voyage No 11221 embarks in Nice on 26 May, spends the next day, race-day, moored at Monte Carlo, and then visits St Tropez (France); Portovenere, Viareggio, Elba and Portofino (Italy), with disembarkation on 2 June in a much quieter Monte Carlo.